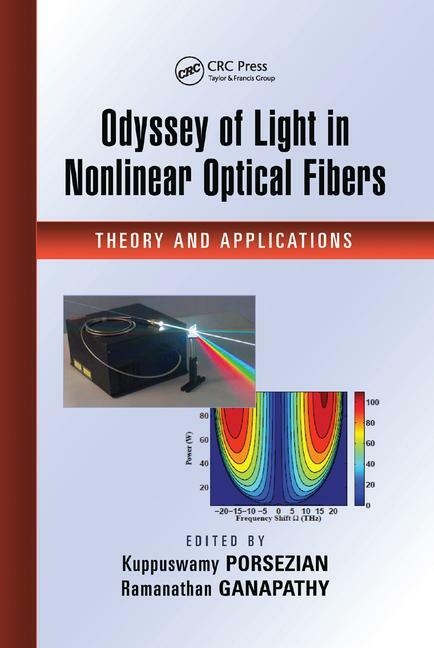 Odyssey of Light in Nonlinear Optical Fibers: Theory and Applications presents a collection of breakthrough research portraying the odyssey of light from optical solitons to optical rogue waves in nonlinear optical fibers. The book provides a simple yet holistic view on the theoretical and application-oriented aspects of light, with a special focus on the underlying nonlinear phenomena. Exploring the very frontiers of light-wave technology, the text covers the basics of nonlinear fiberoptics and the dynamics of electromagnetic pulse propagation in nonlinear waveguides. It also highlights some of the latest advances in nonlinear optical fiber technology, discussing hidden symmetry reductions and Ablowitz–Kaup–Newell–Segur (AKNS) hierarchies for nonautonomous solitons, state-of-the-art Brillouin scattering applications, backpropagation, and the concept of eigenvalue communication—a powerful nonlinear digital signal processing technique that paves the way to overcome the current limitations of traditional communications methods in nonlinear fiber channels. Key chapters study the feasibility of the eigenvalue demodulation scheme based on digital coherent technology by throwing light on the experimental study of the noise tolerance of the demodulated eigenvalues, investigate matter wave solitons and other localized excitations pertaining to Bose–Einstein condensates in atom optics, and examine quantum field theory analogue effects occurring in binary waveguide arrays, plasmonic arrays, etc., as well as their ensuing nonlinear wave propagation. Featuring a foreword by Dr. Akira Hasegawa, the father of soliton communication systems, Odyssey of Light in Nonlinear Optical Fibers: Theory and Applications serves as a curtain raiser to usher in the photonics era. The technological innovations at the core of the book form the basis for the next generation of ultra-high speed computers and telecommunication devices. Kuppuswamy Porsezian received an M.Sc from the University of Madras, Chennai, India, and a Ph.D from Bhrathidasan University, Tiruchirapalli, India. After working as a research scientist with the SERC, Department of Science and Technology (DST), Government of India Project, he joined the Department of Physics, Anna University, Chennai, India as a lecturer. Highly decorated and widely published, Dr. Porsezian is currently a professor with the Department of Physics, Pondicherry University, Puducherry, India. His current research interests include solitons and modulational instability in nonlinear fiberoptics, self-induced transparency solitons, nonlinear pulse propagation in periodic structures, metamaterials and photonic crystal fibers, and integrability aspects of nonlinear partial differential equations. For his research work, he has received several awards and honors. He is also a fellow of the Indian Academy of Sciences and the National Academy of Sciences. Ramanathan Ganapathy received an M.Sc in physics from the University of Hyderabad, India, and an M.Phil and Ph.D in physics from Cochin University of Science and Technology, Kochi, India. Dr. Ganapathy worked as a post-doctoral fellow for three years in the CSIR-sponsored project Nonlinear Dynamics of Femtosecond Pulse Propagation in Nonlinear Fibers at Pondicherry University, India. Presently, he is working as a senior assistant professor at the Centre for Nonlinear Science and Engineering, School of Electrical and Electronics Engineering, SASTRA University, Thanjavur, India. "… a really outstanding collection of reviews presenting a broad view of the current theoretical and experimental research in photonics and related fields." "…multiple experts cover extensive ground in more than 20 chapters and nearly 570 pages. Some chapters assume that the reader is familiar with the basics, but regardless, chapters are well illustrated with good reference lists. Overall, it is a good book on nonlinear fibers covering basic theory and applications."